Colonel Bowes enrolled under the Direct Entry Officer Plan in August 1985. On completion of Basic Officer training at CFB Chilliwack and Armour Officer training at CFB Gagetown in November 1986, he was promoted Lieutenant and posted at CFB Petawawa. He began his career in the Armoured Corps as a Troop leader with the 8th Canadian Hussars (Princess Louise’s) (8CH) as part of the Special Service Force/2 CMBG. In July 1987, he accompanied the 8 CH as it rotated to Germany for duty with 4 CMBG at CFB Lahr, where he served as a Troop Leader, Liaison Officer and Acting Battle Captain. In 1988, he was promoted to Captain and subsequently served as Assistant Adjutant. In the Summer of 1989, he was posted to the Canadian Forces College Toronto where he served as SO2 Curriculum Support, while holding the secondary duty as Staff Officer to the Commandant. In July 1991, he made his way back to Lahr where he again served with the 8 CH as Squadron Second in Command, A Squadron, and Regimental Adjutant. In the summer of 1993, he was posted to Moncton to continue to serve with the 8 CH as Regimental Adjutant of the newly formed Total Force Regiment. In June 1994, he was posted to the Armour School at CFB Gagetown where he served as the School Adjutant. In May 1995 he was promoted to Major and posted to CFB Valcartier to attend the Continuous French Course. On arrival, he re-badged to wear the accoutrements of the 12e Regiment Blindée cu Canada (12eRBC). On completion of the yearlong French course, he was posted to the 12eRBC, serving first as Commandant d’escadron C and later as Commandant d’escadron Commandment et Service. After a two-year tour with the Regiment, he was again posted to the CFC Toronto, this time to attend Command and Staff Course 25. In July 1999, he was posted to Combat Training Centre (CTC) Headquarters as G3 Army Individual Training. In June 2000, he was promoted to Colonel and appointed G3 CTC, a post he held for three years. 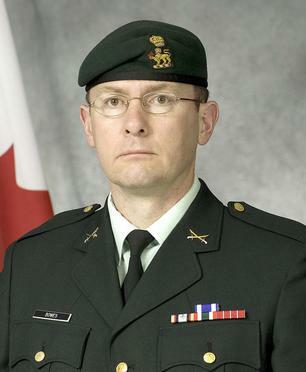 In June 2003, Colonel Bowes took command of the Royal Canadian Armoured Corps School. Colonel Bowes was promoted to his current rank in April 2005. He has just finished a tour as the military commander of the Kandahar Provincial Reconstruction Team.